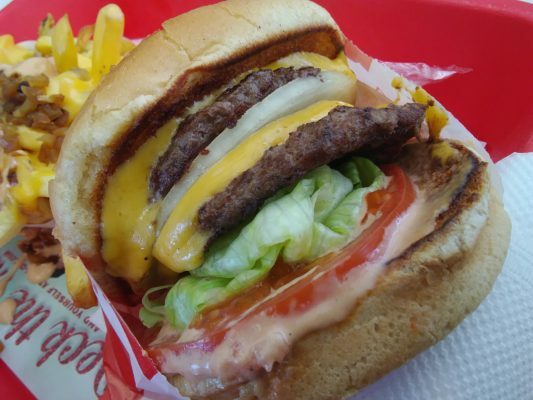 We do not need In-N-Out. We do need Shake Shack. Shake Shack is ridiculously overpriced. I got a burger, and a shake, no fries and it was like $11. And their $5 shake was no better than any shake I’ve had at Braums. Which is pretty shameful. I getting really tired of you Pro Nanny State Leftist preaching to me what I should and should not eat. So what if they come here? Nobody’s holding a gun to your head and making you eat it. I really don’t like anything coming out of the Peoples Republic of California but I think we should have a choice. One could say that you are… pro-choice. 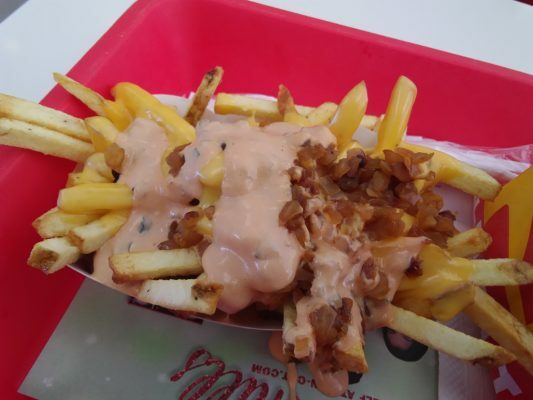 Ate at an In-N-Out in Dallas on our way to Galveston a year or so ago. Was not impressed at all. In fact, when we head to Galveston a couple times a year and looking for someplace to grab a bite to eat, that place is always shot down. California (and Texas) can keep ’em. If you can hold out long enough, Sam’s at Fairfield has good reddish-sauce barbecue — and little loaves of bread that are almost dessert (or at least it did at one time). Further on down the road, Mr. Hamburger (home of the King Kong and Killer burgers) in Huntsville is mighty fine though it has to go up against the darker-sauce barbecue at the New Zion Missionary Baptist Church. If we’re looking for another chain hamburger joint to import to Oklahoma may I suggest and recommend Culver’s. Their Butterburger is the equal, if not superior to Five Guys, but the real stars on their menu are the Concretes (better than Freddie’s) and the fried cheese curds. Midwestern Heaven! Thanks. The 5 Guys website shows a location in Bryant Square in Edmond. I looked for it recently and can’t find it. Does any one know if it still exists or am I looking in the wrong places. There’s one there, it’s next door to Torchy’s Taco on the south side of 2nd street and Bryant and as far as I know, it’s still open. I&O burgers are mediocre at best. Can’t beat a Chuck Burger from the Chuck House any day. I won’t be disappointing if they never come to Oklahoma for whatever reason, I tried one in Fort Worth and couldn’t see what all the fuss was about. I meant “disappointed”, of course. Aw c’mon, how about a trade then? Maybe some Van’s Pig Stands for some In-N-Out outlets? I’m a Californian with deep Oklahoma family roots (along w/an OU alum daughter) and always eat well when I’m back there. 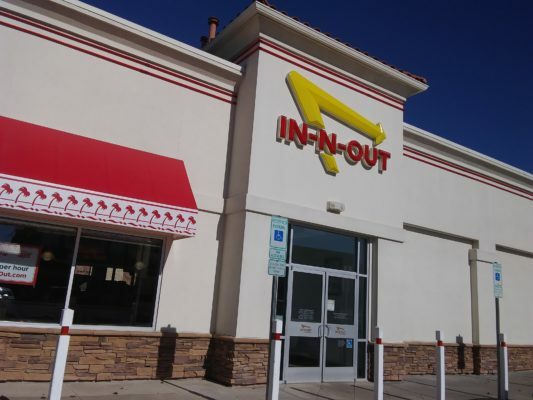 Given that’s it’s fast food, In-N-Out works for me when I’m on the road out here. 5-guys and The Garage beat It. If you want a great burger, drive down to Arbuckle lake and try Fat Bully’s. They are amazing. Robert’s Grill in El Reno is tasty as heck too. Paddy Wagon is pretty good, I’m a fan of Cow Calf-Hay as well. For the best onion fried burger, coney with slaw and French fries, look no further than El Reno. SIDS GRILL is, by far, the best burger I have ever eaten. I remember Marty (the owner), along with his dad and brother serving me up the same time tested fare at Johnnies grill in the late 60’s. Look no further, greatness is only 20 minutes west. Do you remember Ross’s hamburgers in El Reno? 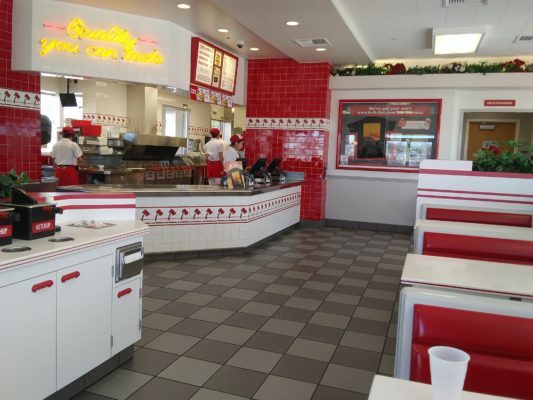 Idk, I like In & Out for the cleanliness and affordability. I’ve always had a positive experience when eating there. I like our local places as well but will say I have grown tired of paying $14 for a burger, fries and a soft drink from someplace cashing in on an Oklahoma staple, onion burgers. I mean, the whole point of an onion burger is to stretch the meat out and make it easily affordable. David, I don’t go to 5 guys in Oklahoma because frankly they aren’t as GOOD as the franchise in Mass – you big Okie dummie. 🙂 Location, location. The same reason I like Texas Longhorn steak house in Oklahoma better than the one in Mass. I want burgers from north of the border, but Oklahoma is too far south of the border for that to be practical.